Birtley is the only lintel manufacturer to hot-dip galvanize after fabrication providing up to 50% more zinc protection than other approved coatings. Hot Dip Galvanizing to EN1461 offers superior corrosion protection and lifespan compared with pre-galvanized steel. We offer a 65-150µm zinc coating thickness to suit life expectancy and exposure class. Our lintels are the only lintels to deliver consistent protection to all parts including welds and cuts, which are otherwise only protected by paint on pre-galvanized alternatives. There’s a Birtley lintel for any application. Birtley provides comprehensive technical support to designers, specifiers, builders and merchants covering all aspects of the design, specification and installation of Supergalv lintels. Birtley began life as Birtley Building Products in 1965, based at the current site in County Durham. Originally a steel fabricator for the area’s mining and power generation industries, the company made its first steel lintels in 1967. 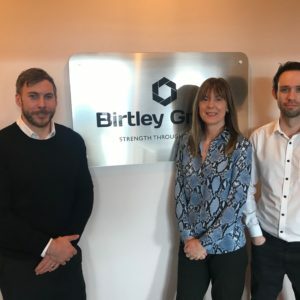 Since then, Birtley has grown from reliable local supplier to a UK-wide force in construction design technology and product development. In 1889, the British Metal Expansion Company was established in Hartlepool. It had sole European rights for the manufacture of expanded metal mesh, mainly for use as reinforcement and lath in the rapidly expanding sector of concrete construction. The business that grew from these early days later changed its name to Expamet. Acquired by Birtley Group in 2015, Bowater Doors is a nationally-known name synonymous with top quality and imaginative composite residential door design and manufacture. The product portfolio offers exclusive ranges for trade installers and a retail range providing doors direct to consumer and social housing organisations. Birtley Galvanizing boasts one of the most impressive galvanizing plants in Europe. The plant achieves the finest quality hot-dip galvanized zinc protective coatings to BS EN ISO 1461. Using state-of-the-art technology the plant processes steel products using a computer controlled, automated handling system, enabling Birtley Galvanizing to provide full project solutions to many industries. By providing your email address and contact details you consent to Birtley Groups companies and our customers contacting you with information about products and services that may be of legitimate interest to you in your professional capacity. The legal status of this transaction in accordance with GDPR compliance is 'contract'.